Everybody manages to get to the gym or their fitness classes most weeks but what people find hard to do is preparing their food to refuel their body. It is a lot simpler than you may think once you get in to a routine, that Sunday night meal prep will be second nature. I was hitting the gym and kickboxing up to 5 times a week and with my fast metabolism (of a 12-year-old according to the scales) I was struggling to put on muscle and stay full of energy. So, I started to consider what I was eating and with the help from David Kenyon I was just not meeting the correct macros. So I got some chicken breasts from Morrison’s, which were dirt cheap as they always run offers on meat! Picked up a few packs of the good old uncle bens rice and the most important thing is the marinade, as you don’t want to be eating bland food as it all goes to waste. Sunday night came and I put an hour aside to prepare. I cooked the chicken put them all into containers and I boiled some vegetables to go alongside the chicken to get that 5 a day in! By the time you know it you have chicken in containers ready for the week ahead with the packs of rice you can put in the microwave for 2 mins at work with the chicken and there you go. I brought a small bottle of sweet chili sauce to work to add that little bit of spice. 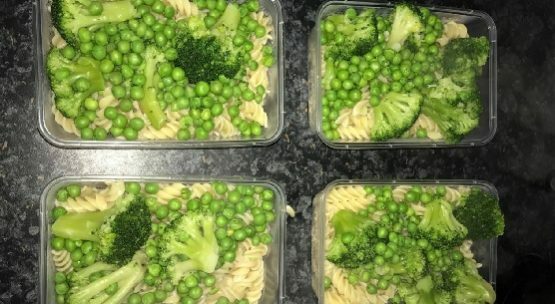 Meal prep was a success! All I need to do now is keep experimenting with different foods! From doing this for a while now I am seeing the differences already I am meeting my goals and feeling much fuller throughout the day (which means less trips to the vending machine) and I am focused on my food and it’s all prepared for me to just eat throughout the day.